Every person has a unique history. A culture. A past. With the hustle and bustle of day-to-day life nowadays, it’s easy to get caught up in the present. Far too often we rush ahead at full speed ready for the next thing life throws at us, forgetting to take the time to sit and reflect on the history of those who came before us. My husband and I sat talking about this one night, and decided we needed to do something different. It’s important to us that our two children, Evan and Erin, learn the history of our culture. We decided to plan a family trip to help them do just that, and we knew just where to go. Kansas City, KS has a rich history—there are several sites with interesting and engaging experiences that immerse visitors in black culture, and with a 12-year-old and a 14-year-old, enriching and attention-keeping are important. The town of Quindaro, now known as Kansas City, KS, was one of the very first free soil ports of entry into Kansas back in 1856. The first stop on our journey was the Quindaro Ruins. The town of Quindaro, now known as Kansas City, KS, was one of the very first free soil ports of entry into Kansas back in 1856. Western University was first named Quindaro Freedman’s School. It was founded in the 1860s and educated the children of escaped slaves and black families that had come to the area to settle. All that’s left now are a few cornerstones from the university buildings—centuries-old brick foundations with leafy green plants now growing riotously around them. We stood as a family on the stone platform of the Quindaro Ruins Overlook and imagined what life must have been like for the parents and children eager for freedom after their long hard journeys. The nearby life-size marble statue of famous abolitionist John Brown, unveiled in 1911 and located on the corner of Western University, is a testament to the strength of conviction that finally led to the emancipation. The town of Quindaro was a very important stop on the Underground Railroad during this time in history. At the Old Quindaro Museum, we marveled over the amazing artifacts that told us more details about the slaves who had their first taste of freedom in this very same location. How amazing and scary at the same time it must have been for them. These incredibly brave individuals built a thriving all-black community that was complete with churches, schools and businesses. My husband and I explained to Evan and Erin that while these former slaves were able to find freedom in Kansas, just on the other side of the river in Missouri slavery was still in full effect. Learning about the families seeking refuge here was one thing, but seeing the chains used on slaves and the huge knives that the slaves used to cut corn stalks in the fields really drove the points home. We learned that they used these stalks to hide women and children from slave hunters who were determined to find them and bring them back to a life of slavery. We learned that the Native Americans who lived in the Kansas Territory during this time welcomed the runaway slaves with open arms. I saw the awe in my children’s faces, and at times looks of sadness, as they empathized with the rough life that these individuals had to endure. Erin admitted that she hadn’t realized just how hard life was during those times, especially for children her own age. Evan admitted that he too only thought of slavery as something that happened in the South, and didn’t spend much time thinking about how close to home it really was. We learned that the Native Americans who lived in the Kansas Territory during this time welcomed the runaway slaves with open arms. They worked hard to keep them safe and gave them the land that would later become the community of Old Quindaro. What an amazing lesson on the importance of kindness, compassion and looking out for our fellow human beings. We made sure to stop by the Quindaro Underground Railroad Museum nearby, as well. 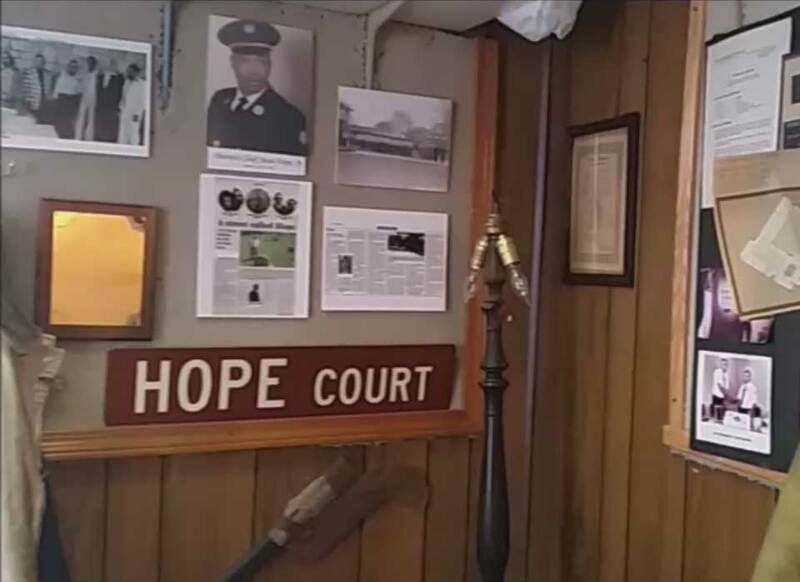 This one-room display showcased artifacts that tell the history of the Quindaro area. The artifacts were accompanied by photos and actual clothing from this era, to help us draw a better visual of what it was like traveling the Underground Railroad right in the city where we were. The schools remained segregated all the way up until 1978, when a court-ordered desegregation led to the closing of Sumner High School and the eventual reopening as Sumner Academy of Arts and Sciences, a school that welcomed students of all races. Evan and Erin were familiar with Sumner Academy of Arts and Sciences, and have even had friends who have attended school here. Needless to say, they were a bit confused as to why this school would be a stop on our journey into history. What they didn’t know was that before it was Sumner Academy, this school was Sumner High School. Sumner High was founded after a white child was killed during an altercation with an African-American child. Due to that accident, Kansas City High School was segregated and all black students were sent to Sumner High School. The schools remained segregated all the way up until 1978, when a court-ordered desegregation led to the closing of Sumner High School and the eventual reopening as Sumner Academy of Arts and Sciences, a school that welcomed students of all races. Most inspiring about this location was the Chester C. Owens Sumner Alumni Room, which highlighted the many academic and athletic achievements of the students at Sumner High School, prior to desegregation. These achievements are a testament to the ability of these students to rise above mediocre standards and seek excellence, regardless of the adversity they faced. While we may have set out to better understand our culture, our entire family gained a brand new sense of humility and a much stronger appreciation of what we have. On the way home, we spoke about our feelings and the things we had seen. We found more than just information on our culture and history in Kansas City, KS. We found a connection that our family will share among us for the rest of our lives. It was an experience that made us stronger and wiser as individuals, but most importantly as a family unit as well. I can’t think of a better lesson to teach my children.